Radio Active tells the story of how radio listeners at the American mid-century were active in their listening practices. 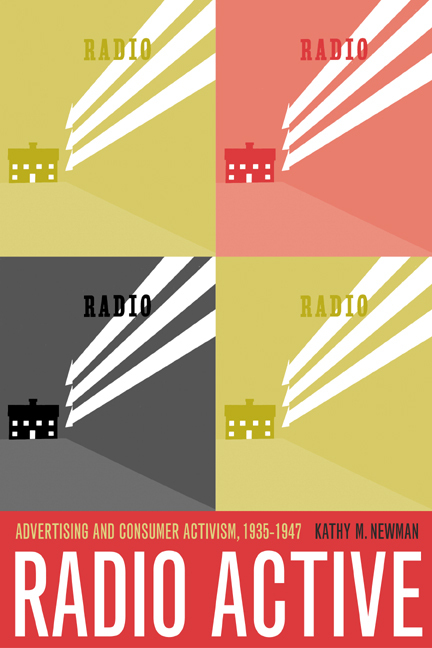 While cultural historians have seen this period as one of failed reform—focusing on the failure of activists to win significant changes for commercial radio—Kathy M. Newman argues that the 1930s witnessed the emergence of a symbiotic relationship between advertising and activism. Advertising helped to kindle the consumer activism of union members affiliated with the CIO, middle-class club women, and working-class housewives. Once provoked, these activists became determined to influence—and in some cases eliminate—radio advertising. As one example of how radio consumption was an active rather than a passive process, Newman cites The Hucksters, Frederick Wakeman's 1946 radio spoof that skewered eccentric sponsors, neurotic account executives, and grating radio jingles. The book sold over 700,000 copies in its first six months and convinced broadcast executives that Americans were unhappy with radio advertising. The Hucksters left its mark on the radio age, showing that radio could inspire collective action and not just passive conformity. Kathy M. Newman is Associate Professor of English at Carnegie Mellon University.